Precipitation is one of the most important variables affecting biodiversity in all ecosystems. This holds especially true for tropical mountain forests of the andes, where additional water input is provided by scavenging of fog and cloudwater. Unfortunately, knowledge of the precise amount of precipitation in this regions is very scarce and temporal and spatial distribution is almost unknown, due to the low density of climate stations. The Project PREDICT employs modern techniques like remote sensing (Radar, satellite imagery) and meteorological data, to overcome this limitations. of Fog collectors and rain water samplers, installed in an altitudinal gradient, provide information about vertical variations of rain and fog input. The data are collected with high temporal resolution and on a long-term basis. Rainfall for this area is much higher than known and a significant amount is contributed to the hydrological cycle by fog-scavenging. Rainfall distribution in the study area is highly dependent on orographic situation and exposition to the prevailing easterly tradewinds. Fog input is controlled by windspeed, cloudiness and topographic situations. Rainfall maximums of 5500 mm/year are exceeded in some parts and fog may contribute further 400 to 500 mm annually. La precipitación es uno de los variables mas importantes, que afecta la biodiversidad en todos los ecosistemas. Este hecho se aplica especialmente a los bosques tropicales de montaña de los Andes, en donde la neblina y la nubosidad contribuyen una cantidad significante. Deasafortunadamente, la cifra precisa de precipitación y la distribución temporal y espacial en dicha región queda desconocida por la falta de estaciones climaticas. El proyecto PREDICT emplea métodos modernos de sondeo remoto (Radar, imagenes satelitales) y datos meteorológicos, para superar estas limitaciones. de Dispositivos de captación de niebla y de lluvia instalados en un gradiente altitudinal sirven para colectar información acerca de las variaciones verticales y espaciales de la entrada de precipitación. Los datos se recolecta con alta frecuencia y a base de una serie temporal estrecha. La cantidad de lluvia en esta región es mas alta como se habia conocido y una cantidad significante esta contribuida al balance hídrico por captación de neblina y agua de las nubes. La distribución de la precipitación depende altamente de la situación orográfica y la exposición a los vientos alisios, que dominan aqui. La captación de neblina esta controlada por la interaccion de la velocidad de viento, nubosidad y la situación topográfica. Las maximas de precipitacion superan valores de 5500 mm por año en ciertas partes y la captación de neblina adicionalmente contribuye appr. 400-500 mm anuales. Precipitation is one of the most important meteorological elements which determines vegetation zonation of the tropical Andes (Lauer, 1981; Richter, 2003). Spatio-temporal information on rainfall amount and dynamics in these areas is rather poor for several reasons (e.g. Barry, 1992). Rain gauge data are only sparsely distributed and frequently located in drier valleys and are hence less representative for the whole mountainous area. Furthermore, measurements with rain gauges reveal specific errors especially in windy environments such as the tropical high mountains (Sevruk 1986). Numerical models are currently not yet reliable enough for representing rainfall dynamics in a high spatio-temporal resolution as is required for climate ecological studies in tropical high mountains due to several restrictions (Golding, 2000; Mecklenburg et al., 2000). Major progress in the retrieval of precipitation from satellite data (optical and microwave sensors) has been achieved over the last few years (e.g. Bendix, 2000; Reudenbach et al., 2001; Bendix et al., 2003; Levizzani, 2003). 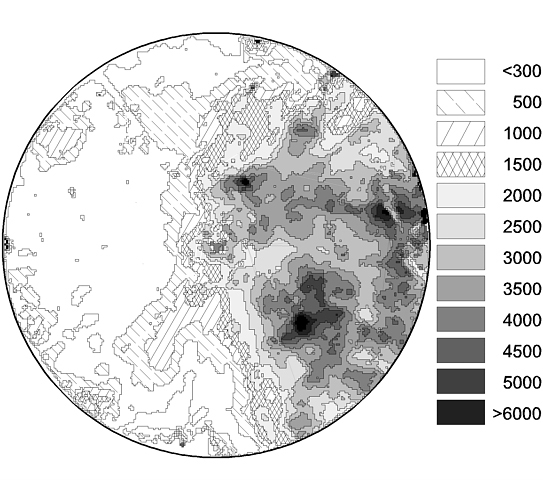 However, the spatial/temporal resolution of rainfall data as provided from the geostationary/polar orbits does not match the requirements of limited-area ecological research. In some countries, operational ground based weather radar networks mostly operating in the C-band offer great opportunities to observe precipitation dynamics at a high spatio-temporal resolution. 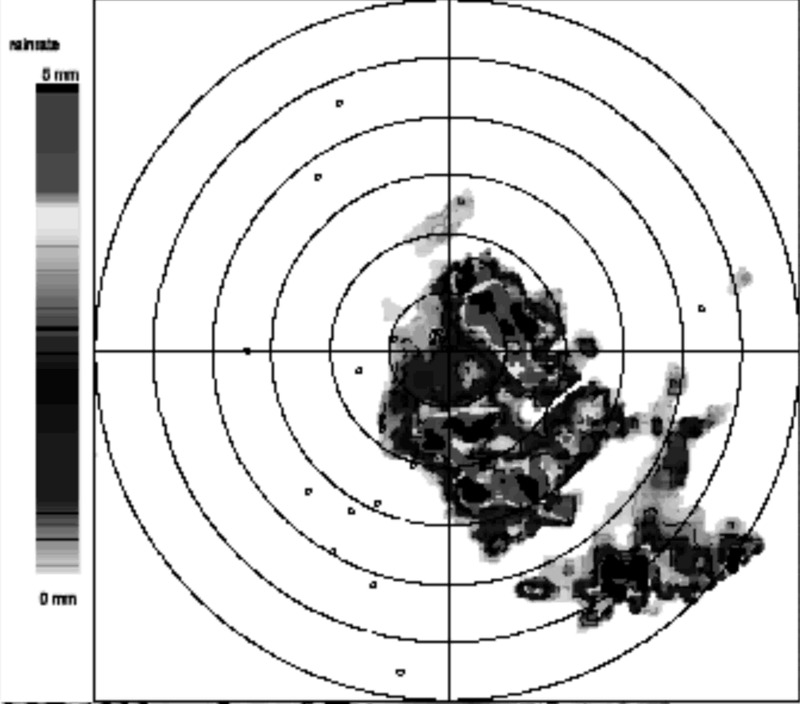 A spatial resolution which is more appropriate for climate-ecological studies can be provided by X-band radar technology. Unfortunately, neither operational radar networks nor local radar sites are available in most countries such as Ecuador. Experimental cost-effective weather radar systems which are based on ship radar technology have recently become available and seem to be an appropriate tool for climate-ecological studies (Jensen 2002, Rollenbeck & Bendix 2005b). Another important factor contributing to the hydrological balance is scavenging of fog and cloudwater. Many efforts have been made to detect this form of water input (Walmsley&Schemenauer 1996, Bruijnzeel 2000), but no general methodology was developed and results of different locations and studies are hardly comparable. It seems probable that only combined methods of landscape modeling and in-situ measurement are capable to quantify this atmospheric contribution to the water balance. The study area is located in southern Ecuador covering an altitudinal range between 800 and 3,600 m asl (Fig. 1). The region covered by the radar comprises the humid eastern Andean slopes, which are characterised by tropical rain forests up to ~1,800 m asl, and tropical evergreen cloud forests at altitudes >1,800 m asl, as well as the relatively dry basins and valleys west of the main Cordillera Oriental de los Andes, which are partly covered by xerotropical vegetation (Richter 2003). 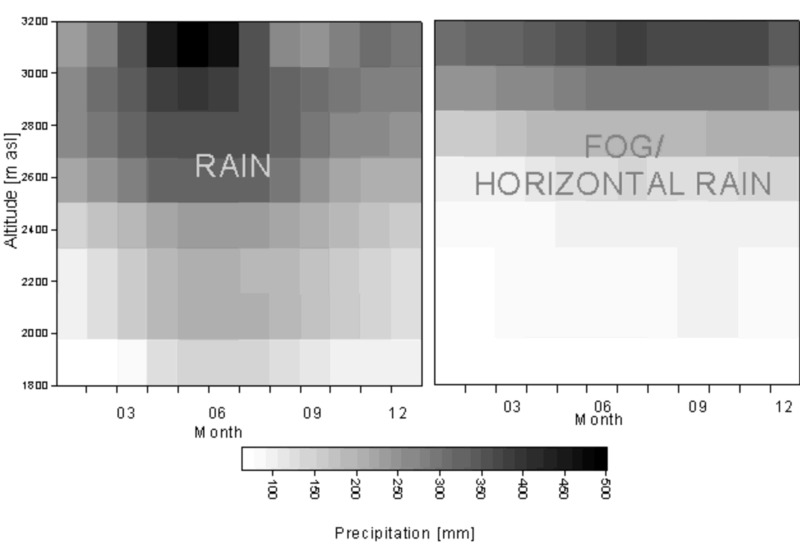 Spatio-temporal rainfall dynamics are analysed by using weather radar images of an X-band local area weather radar (LAWR) setup as part of the project. The radar site is located within the Reserva Biósfera de San Francisco, the central investigation area of the joint research group. At the research station Estacíon Científica San Francisco (ECSF, 3°58' S / 79°04'W) data are compiled and archived (Fig. 1, right, refer also to Beck & Müller-Hohenstein, 2001). The LAWR is a low-cost alternative to professional weather radar systems. It provides the typical range of X-band systems (60 km radius) but lacks some of the more sophisticated capabilities of operational systems, as e.g. vertical scans or Doppler technology (Rollenbeck et al. 2005b). As far as we know, it is the first weather radar installed in the Andes and the first to be used in eco-climatological studies. 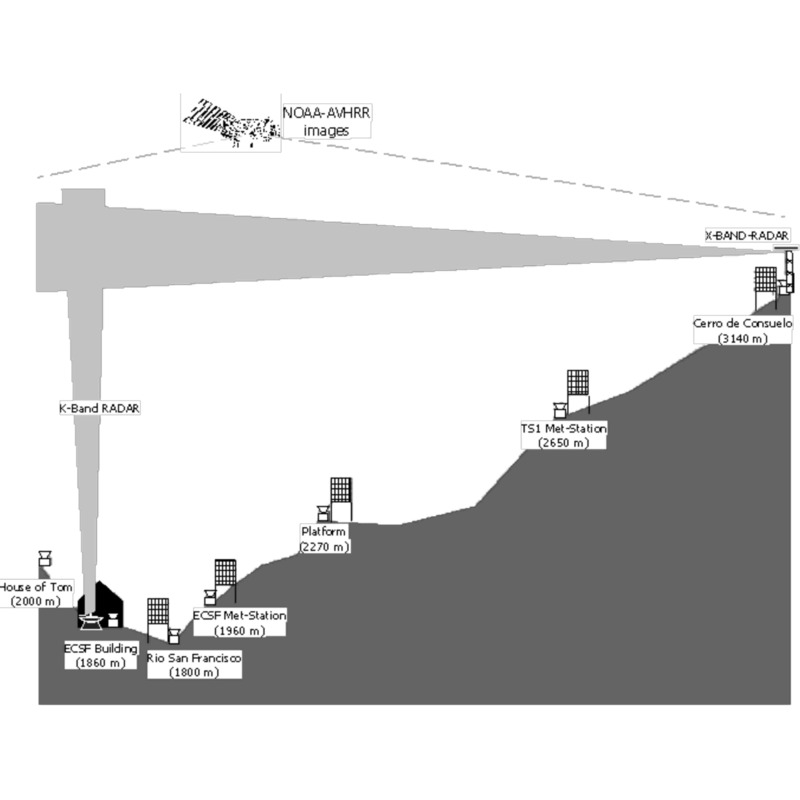 The system is installed on the highest peak of the study area, the Cerro de Consuelo at 3200 m asl. This site guarantees the least obstructed view in the highly mountainous region. The range extends far over the central study area, which provides insight into larger scale rain formation processes and thus helps to understand the climatological and orographic influence of mountains on rainfall distribution in general. Images are generated every 5 minutes and have a resolution of 500x500 m. Hence, the central study area is covered by about 50 radar pixels, which is a great advantage as compared to the three point observations from the existing climatic stations (Fig. 2). However, calibration of the LAWR data strongly relies on the existing station network that was supplemented by 6 additional totalling raingauges along the altitudinal gradient. Fog water input is determined by six quadratic polypropylene mesh collectors which are installed along the altitudinal gradient as well. The mesh collectors were chosen due to their simple setup and are exposed to the prevailing easterly wind direction (frequency of winds from the easterly sector ~90 %) (Rollenbeck et al. 2005a). To evaluate the characteristics of these manual collectors, a central location (1960 m asl) in the study area, close to the main research station, was chosen to install a set of more sophisticated automatic instruments, providing data on clouds and precipitation with a temporal resolution of five minutes: (a) A BIRAL VPF-730 scatterometer measures atmospheric extinction and horizontal visibility, rain rate, particle number, droplet spectra and rain type. (b) Fog water is sampled by an automatic impact collector (Eigenbrodt NES210 coupled to fog detector ONED 250). An automatic rain water sampler collects samples of wet deposition, determines rain rate and measures the values of pH and electric conductivity online. Sample bottles are automatically changed every day. Operation time is recorded on a standard PC in order to calculate average liquid water content for the sample intervals. (c) An automatic climate station provides hourly data of temperature, relative humidity, windspeed and –direction and global radiation (Fig. 2). The measurements inside the central research area are extended by additional stations in a wider environment: 10 km to the west, the site "El Tiro" is equipped with another fog collector, a rain gauge and an automatic climate station. Five automatic weather stations and five official principal stations of the Ecuadorian weather service (INAMHI) operate in the range of the weather radar LAWR. Data are used for calibration of the measured reflectivities (conversion to rain rate). Weather satellite data for the entire area of Ecuador are obtained by the project-owned HRPT (High resolution picture transmission format) receiving station which is operated in cooperation with INAMHI at the headquarters in Quito (Bendix et al. 2003). On average two daily passes of the NOAA satellite series (AVHRR imagery) are captured and transferred via internet to Marburg (Germany) for further analysis. In a field campaign from December 2001 to April 2003, additional measurements of vertical rainfall profiles were performed by using a vertical K-Band Doppler rain radar (METEK MRR-2, Klugmann et al. 1996). These measurements were generally made at the ECSF station building in the Rio San Francisco valley at 1850 m asl., with supplementing mobile measurements being made in the range of the LAWR radar (up to 45 km distance). To ensure continous observation of the synoptical situation in the San Francisco valley, a simple digital weather cam was installed at the ECSF station building. An image is taken automatically every five minutes. These data allow monitoring and detection of the cloud base altitude (local condensation level) in the neighborhood of the ECSF research area. The region of the study area, the so called "Nudo de Loja" (knot of Loja, s. Fig. 1) is characterised by an extreme spatial variability of climate. Whereas the town of Zamora 20 km to the east of the study area receives >2000 mm of rain per year in 12 humid months, the valley of Catamayo 70 km further west is fully arid (12 arid months) and receives only 300 mm rainfall on average (Richter 2003). The huge climatic contrast is caused by the configuration of the main cordillera which is not characterised by two well separated chains as in the rest of Ecuador and major parts of Peru and Colombia, but is grouped into several mountain chains that form a cascade of barriers and valley intersections. This causes an intensive mixture of ecoclimatic conditions and the lowest traverse for air masses crossing the Andes. mm per year for some exposed parts of the eastern slopes of the Andes, meanwhile the whole western half of the image hardly exceedes 600 mm, even at the mountain tops. Distribution of cloud frequency (not shown here; s. Bendix et al. 2003) shows similar results. The eastern slopes have higher cloud frequencies than the lowlands of the amazon basin. West of the Loja region a low cloud frequency reveals arid conditions. The central study area is characterised by a "tongue" of high cloud frequency, entering from the east and continuing to north-west. The annual variability of rain distribution cannot only be attributed to the prevailing easterly flow. The season between September and April shows a more varying distribution of rainfall. These are times when the less frequent westerly flow causes heavy convective rainfall at the western slopes of the Cordillera which are normally under "Föhn"-influence induced by the tradewinds. In contrast to that, the season from May to September shows an almost unique pattern of rainfall formation. Very frequent but less heavy precipitation is responsible for the high totals at the eastern slopes. The data from the vertical pointing MRR-radar show an altitudinal increase in rain intensity measured at the station building and hence representative of the San Francisco valley. Rain intensity in the free atmosphere is increasing by 35 % to the altitude of 3200 m asl or 1400 m above the measurement point. This value is also supported by the registering rain gauges and fog collectors (s. below). The average annual total for the research area was calculated to be 2050 mm (period 1998-2004) at an altitude of 1960 m, increasing to ~4400 mm at the Cerro de Consuelo (3200 m). This corresponds to a vertical gradient in atmospheric water input of ~150 mm/100 m. Actually this gradient is not linear: up to 2600 m rain fall increases by 250 mm/100m, then the gradient decreases to 100 mm/100m. For fog input this gradient is 40 mm/100m up to 2600 m, then increases sharply to 180 mm/100m (s. Fig. 4). Fig. 4: Height/time section of monthly totals of rain and fog/horizontal rain in the central research area. The nonlinearity of the gradient coincides well with results of personal observations and synoptical data from the weather cam images. Generally, condensation level and highest cloud frequency is observed between 2500 m and 3400 m. Fog frequency for these altitudes is about 80 % (3200m). The relative numbers show, that with increasing altitude fog water (and horizontal rain) plays a more important role for the total of atmospheric water input. An areal sum of the total precipitation for the study area is in the range of 3600 mm per year, which is 80 % higher than the conventional measurements of the primary climate station at 1960 m indicate. The data of the LAWR radar, the vertical K-Band radar and satellite imagery were combined to interprete the temporal and spatial distribution of rain generating processes. Besides the well known phenomena of exposition, which controls the formation of orographic clouds and rain, diurnal oscillations were detected that indicate an interaction between the andean mountain chain and the amazon basin east of the cordillera. Untypical for tropical environments, the daily precipitation maximum at the ECSF station occurs in the early morning hours, between 4:00 and 6:00 local time (LT). 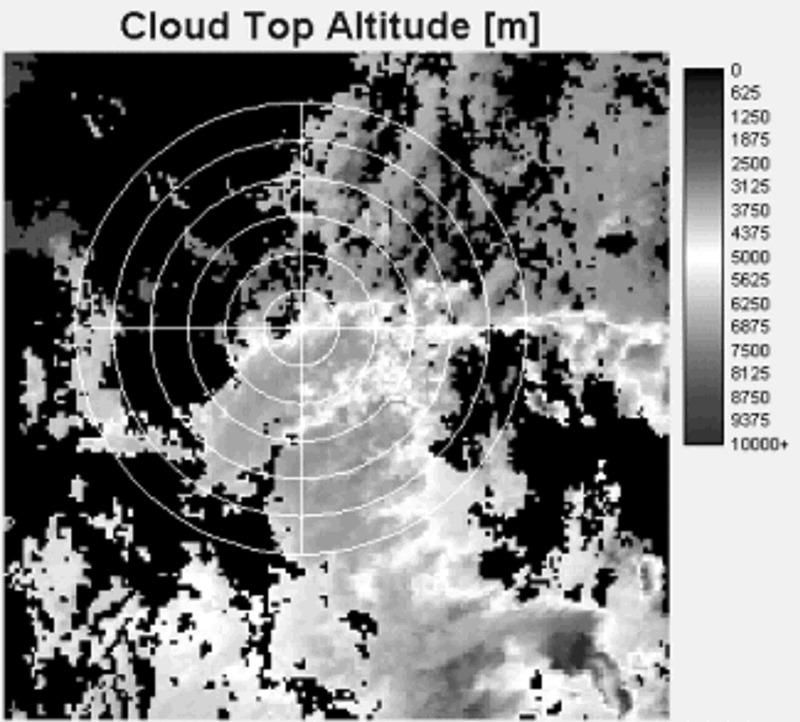 By analysing several case examples, the formation of mesoscale cloud systems (MCS) could be observed in the satellite images (NOAA-AVHRR), that showed low cloud top temperatures which may indicate deep convection cells. These MCS typically develop around midnight south-east of the study region (s. Fig. 5) and start to travel slowly with the trade winds in westerly directions. In the morning hours these cloud complexes are exposed to orographic uplifting at the eastern escarpment of the andean chain and produce stratiform rain fall, which can be seen in the radar images as extended rain fields covering the whole center of the observed range (Fig. 6). A possible interpretation of this process is based upon the fact, that local/regional katabatic winds occur every night and transport masses of cold air into the amazon basin. These airflows are channelized by the larger valleys of Rio Marañon and Rio Zamora to the foreland, were they meet with the warm and moist air of the easterly tradewinds. Convergence and the temperature difference are able to cause the formation of local cold fronts with the associated deep convection, which consequently produces rain fall. These systems decay during the course of the night, but the remaining clouds often reach the higher chains of the Andes and the study region, where they cause siginificant amounts of rain in the morning hours. Further local and regional dynamic processes are involved with the development of westwind situations, which sometimes produce convective showers, but sometimes also cause total rain free situations. Further work has to be done to analyse the underlying processes, but certainly analysis of wind fields, derived from tracking radar-observed rain storms will help to understand the dynamics of the rain formation in the region of the Nudo de Loja and in the andean mountain chain in general. Interaction between topographic configuration and rainfall distribution is clearly visible in the radar and satellite images. The extraordinary situation of the "Nudo de Loja" shows extreme variability of rainfall that is impossible to assess with a conventional rain gauge network. Hence remote sensing is the only method to approach this problem in an adequate way. Interannual variability and seasonal differences will be further investigated by continuing measurements for two more years. Very interesting data may arise if it is possible to observe an El Niño episode. The expected altitudinal gradient of precipitation input for tropical montane regions can be confirmed by results of this study. The additional fog input shows that significant amounts of the water balance have been neglected in the past. Further investigations will focus on structural parameters of the vegetation cover, thereby enabling the setup of a fog scavenging model to convert atmospheric fog water content to actual fog water input. Intensive cooperation with other groups will be necessary. Climatological variables like condensation levels, fog and cloud frequency and microphysical precipitation characteristics are used to further analyse rain generating processes. Advective and convective cloud processes directly affect precipitation intensity and frequency. To unify the research effort in the Reserva Biologica San Francisco, a nested multi-scale model will be developed that can enable the simulation of the most important interactions between atmosphere, landcover and soil in a quantitative and impacts of potential land use changes and climate variability. The Project PREDICT is kindly funded (FOR 402/1, BE 1780/5-1 /5-2) by the German Research Society (DFG). We also acknowledge the invaluable support of NCI Ecuador, E. Palacios (INAMHI) for the operation of the NOAA-AVHRR receiving station and M. Richter for supplying rain-gauge data. Barry R.G. 1992. Mountain climatology and past and potential future climatic changes in mountain regions: a review. Mountain Research and Development 12: 71-86. Beck, E. & K. Müller-Hohenstein. 2001. Analysis of undisturbed and disturbed tropical mountain forest ecosystems in Southern Ecuador. Die Erde 132: 1-8. Bendix, J., 2000. Precipitation dynamics in Ecuador and Northern Peru during the 1991/92 El Niño - A Remote Sensing perspective. Int. J. Remote Sensing 21: 533-548. Bendix, J., C. Reudenbach, C. & R. Rollenbeck. 2003. The Marburg Satellite Station (MSS). Proc. The 2002 EUMETSAT Meteorol. Sat. Data Users' Conf., Dublin, Ireland, 2-6 September 2002, EUMETSAT, Darmstadt: 139-146. Golding B.W. 2000. Quantitative precipitation forecasting in the UK. J. Hydrol. 239: 286-305. Lauer W. 1981. Ecoclimatological conditions of the Páramo belt in the tropical high mountains. Mountain Research and Development 1: 209-221. Levizzani, V. 2003. Satellite rainfall estimations: new perspectives for meteorology and climate from the EURAINSAT project. Annals of Geophysics 46: 363-372. Mecklenburg S. J. Joss J. & W. Schmid. 2000. Improving nowcasting of precipitation in an Alpine region with an enhanced radar echo tracking algorithm. J. Hydrol. 239: 46-68. Reudenbach, C., G. Heinemann, E. Heuel, J. Bendix & M. Winiger. 2001. Investigation of summertime convective rainfall in Western Europe based on a synergy of remote sensing data and numerical models. Meteorol. Atmosph. Phys. 76: 23-41. Richter M. 2003. Using plant functional types and soil temperatures for eco-climatic interpretation in southern Ecuador. Erdkunde 57: 161-181. Sevruk B. (Ed.). (1986): Correction of precipitation measurements. ETH/IAHS/WMO Workshop on the correction of precipitation measurements. Zürcher Geographische Schriften 23. Zürich.